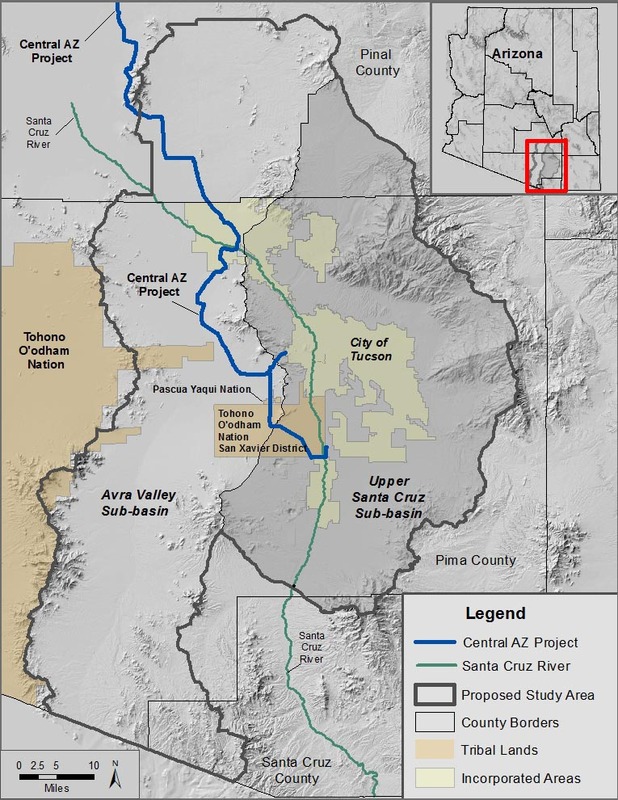 Background: For over 60 years, residents of the Lower Santa Cruz River (LSCR) Basin in Southern Arizona relied on groundwater to meet most water supply needs, with pumping greatly exceeding replenishment. 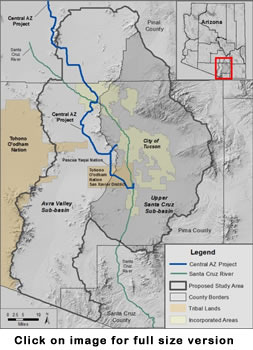 In 1993, the Central Arizona Project (CAP) began delivering Colorado River water to the LSCR Basin. However, there are still significant supply-demand imbalances due to a lack of water delivery infrastructure, insufficient recharge and recovery capacity, and the cost of constructing new facilities. Uncertainty about the future compounds these issues. The CAP has junior priority rights on the Colorado River; thus CAP sub-contractors will bear the brunt of imminent shortages. Climate change poses additional threats and may aggravate the impacts of future droughts. The 4-year study’s overarching goal is to identify where physical water resources are needed in order to mitigate supply-demand imbalances and to develop a strategy to improve water reliability for the municipal, industrial, agricultural, cultural and environmental sectors. The LSCR Basin Study will be a technical assessment and will not make statements of policy or future commitments by Reclamation or its cost-share partners. Cost-Share Partners: Southern Arizona Water Users Association, Pima Association of Governments (PAG), Cortaro-Marana Irrigation District, Arizona Department of Water Resources (ADWR), Central Arizona Water Conservation District, and the University of Arizona. Study Area: The LSCR Basin Study Area encompasses the groundwater basin designated by ADWR as the “Tucson Active Management Area” (TAMA). Most water use takes place between the Pima County / Santa Cruz County line south of the Tucson metropolitan area, and the Pima County / Pinal County line to the north. Selection of relevant climate change scenarios, including Colorado River shortages. Formulation of adaptation and mitigation strategies to address water supply vulnerabilities and preserve groundwater dependent (riparian) ecosystems. Public Involvement: The PAG will be the lead agency for stakeholder involvement. A Stakeholder Advisory Team will be coordinated through PAG’s Watershed Planning Subcommittee or Environmental Planning Advisory Committee. There will also be public meetings, news releases, informational mailings, a study website and an email address for submission of comments. Cost: The total cost of the 4 year study is $1,435,750. Cost-share partners will contribute $718,000 of in-kind services (e.g. staff time, facilities). Reclamation’s contribution of $717,750 may only be used to support work performed by Reclamation or its contractors. Glendale AZ, 85306 Kathleen M. Chavez, P.E.